Big Hero 6 is a 2014 American 3D computer-animated superhero action-comedy film produced by Walt Disney Animation Studios and released by Walt Disney Pictures. It is the 54th film in the Walt Disney Animated Classics series, and is inspired by the Marvel Comics superhero team of the same name. Directed by Don Hall and Chris Williams, the film tells the story of a young robotics prodigy named Hiro Hamada who forms a superhero team to combat a masked villain. Big Hero 6 is the first Disney animated film to feature Marvel Comics characters; whose parent company was acquired by The Walt Disney Company in 2009. Walt Disney Animation Studios created new software technology to produce the film’s animated visuals. 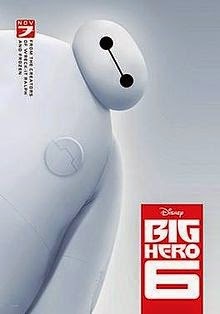 Disney’s next major animation since Frozen comes in the form of Big Hero 6. This movie will certainty appeal to the teenager market more than the 3-6 year old market that Frozen was so successful in marketing. With darker themes and a more intelligent plot the fate of Baymax and Hiro is both funny and intelligent, with jokes being aimed at the teenage and adult market with visuals and action aimed towards children. The plot is immense and brings you into the world of “San Fransokyo” where there are day-to-day business and illegal bot fights. As Hiro’s brother, Tadashi, persuades him to join the local technology university where Hiro first meets Baymax; an intelligent robot who will look after your health – cue all the health and growing up related jokes-. A series of unfortunate events leads to Hiro, Baymax and his friends taking on a villain equipped with micro-bots. So, what makes Big Hero 6 great? Well, the darker plot and more complex nature of the film allows for an older demographic to enjoy and become engaged with the film. Although there are several clichés – which a Disney film would be lost without – it is enjoyable and relate-able. Hiro, at 14 is going through some changes in his life and with the events that transpire at the beginning the emotions are high and low, with his reactions being relate-able. The difference is, Hiro is a robotics genius and is able to combat the problem of his emotions. As the film wraps up, the viewer is pulled through the wringer and the emotions are high. All in all, Disney’s first walk into animated Marvel is a success and in my opinion, much better than Frozen. Go on, enjoy the film! Next Post The world of Pre-order.